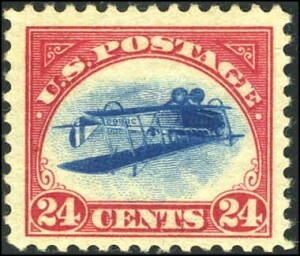 One of the most iconic rarities of United States philately and recognized around the world is the “Inverted Jenny” stamp. This item often transcends the boundary of philately into every day life being written about in books and magazines as well as being featured in television shows and movies. The error came about during the printing process. Since the printing required two different colors, red for the frame and blue for the vignette, the sheet of stamps had to be entered into the printing press twice. Interestingly, errors do occur during printing of stamps with most of them being destroyed immediately. This is one of the rare occurrences were it went unnoticed and eventually was sold to the public. The discovery was made by William T. Robey who purchased the entire sheet of 100 at the New York Avenue Post Office in Washington, D.C. on May 14, 1918. 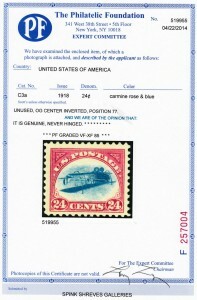 He quickly sold it within one week to well-known Philadelphia stamp dealer Eugene Klein for $15,000.00. The sheet eventually ended up being sold to one of the largest collectors of the time, Col. Edward H.R. Green for $20,000.00. Col. Green had instructed Klein to break up the sheet for him into singles and key position blocks with the intent of selling all but a few. On the reverse, in light pencil, Klein marked the position number of each example. Inverted Jenny stamps come in a variety of conditions due to mistreatment among collectors during the years since it’s discovery – despite it’s rarity and value. Some examples have had moisture damage, thins caused by hinge removal, toning due to improper storage – including some of which has been been mistakenly “lost” and haven’t been seen in decades. Mentioned in Jenny by George Amick, one example was even vacuumed and eventually recovered though damaged. 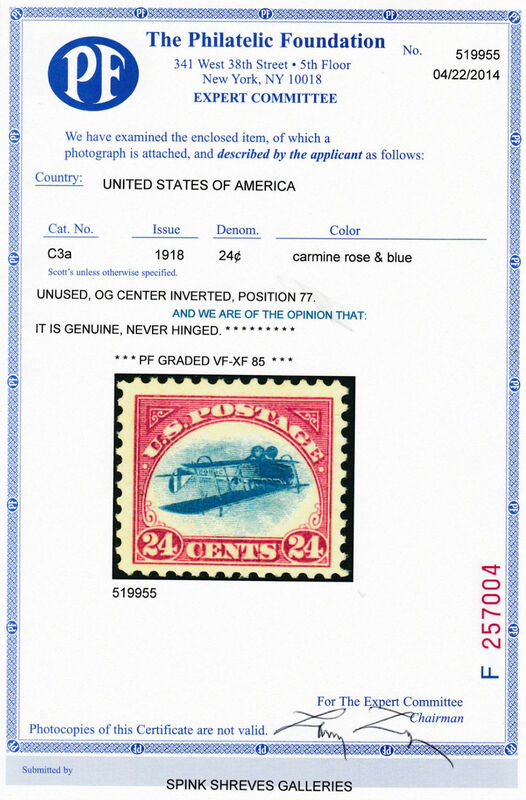 This particular example is believed to be one of only five never hinged examples and is the highest graded example to date having received a grade of “VF-XF 85”. This example came from position 77 in the sheet. Previous owners include “Westport” and J.E. Safra. It was submitted by Spink and was subsequently sold in May 2014 for $500,000.00 plus the buyer’s premium.